Many of our happy customers ask us for homemade blueberry recipes from Grandmom “Millie” DiMeo's recipe book. So we decided to feature some of her family farm recipes with organic blueberries for you to enjoy. 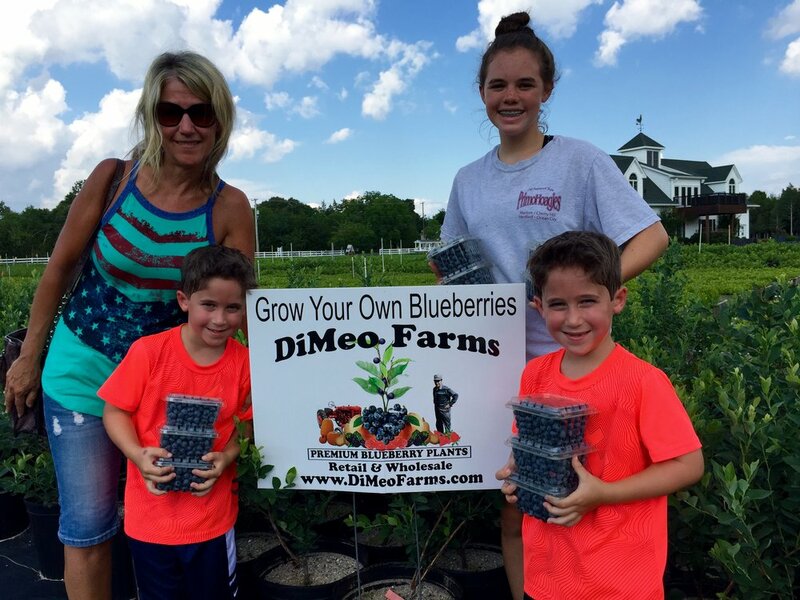 It's lots of family fun in New Jersey at DiMeo's U-Pick Blueberry Farms. The kids make our job fun and we love creating berry healthy memories for families who love coming back every summer. Just like this food blogger who wrote about her experience at DiMeo Farms and baked yummy blueberry doughnuts with her kids. She went NJ blueberry picking at our u-pick blueberry farms in New Jersey and wrote about an amazing kale salad she made with the beautiful DiMeo blueberries they picked at our u-pick farm. Let's get kids back on the farm and eating healthier organic foods. This family was so excited to come blueberry picking at our New Jersey blueberry farms. They couldn't wait to get home to add some blueberries to cereal and make organic blueberry smoothies. We have so many adorable kids that come to our u-pick blueberry farms that want to make blueberry pie, blueberry muffins or blueberry jam with their family. Thank you for baking with DiMeo blueberries. Remember not to wash your blueberries with water until you are ready to use them. We love hosting families like this one below, who drove hours just to pick blueberries at DiMeo Farms in Hammonton. 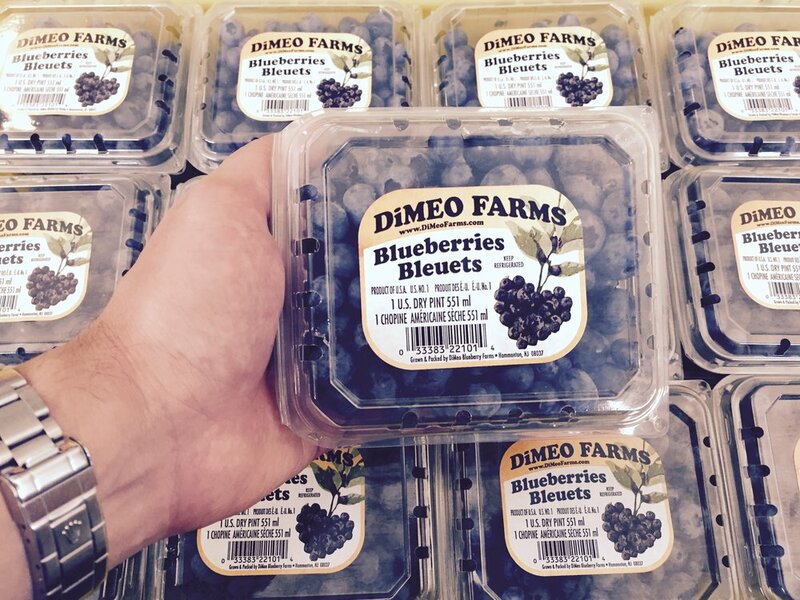 DiMeo Farms has the most clean, upscale u-pick blueberries farm in all of New Jersey. You will take lots of memorable pictures here! We were honored that Hobby Farm Home Magazine chose Grandmom DiMeo's blueberry muffin recipe to feature in it's magazine, which is distributed to people like us, who love farm living and growing blueberries. Not to mention, other healthy aronia berries. We passionately care about protecting, preserving and growing berry farming across America. Enjoy our healthy recipes for blueberry muffins and all other types of blueberry deserts that you can make at home with your family. Start an organic blueberry garden in your own berry backyard with our healthy berry bushes on sale. Call now (609) 561-5905 to make a same-day pick-up appointment or we can ship BIG bearing-size blueberry plants direct to your door. Only $10 each. We also sell blueberry plants, thornless raspberry plants, strawberry plants, thornless blackberry plants and aronia berry bushes as well. Here's how to make blueberry pancakes from scratch with DiMeo blueberry farms old fashioned blueberry pancake recipes direct from Grandmom Mildred "Millie" DiMeo's family farm kitchen in Hammonton New Jersey. There is nothing like a family breakfast on Sunday mornings with organic blueberry pancakes at home. You will enjoy the pancakes even more just knowing that you picked the organic, Non-GMO blueberries yourself in your own backyard garden. Grandmom DiMeo would always make blueberry breakfast pancakes for the family on Sunday mornings and she would often have a jar of her homemade organic blueberry preserves that the grandkids loved to put on their toast. She was an amazing woman. We miss her. In a medium-sized bowl, combine ricotta cheese, melted organic butter and 4 farm fresh egg yolks until all blended. In a small bowl, stir together the flour, raw sugar and lemon peel. Stir dry ingredients into ricotta mixture. In a medium-sized bowl, beat farm fresh egg whites until they form soft peaks. Fold egg whites and then add DiMeo Blueberries or your own organcially grown berries into batter. Over medium heat, form hot cakes by spooning 1/4 cup of batter per blueberry pancake onto a hot lightly greased griddle or skillet. Cook the blueberry pancakes nicely, turning once, until your homemade blueberries pancakes are browned in about 4 minutes. Yields 24 delicious old fashioned homemade blueberry pancakes from scratch by Grandmom Millie DiMeo's blueberry farm kitchen are made with only the freshest Jersey Fresh farm ingredients and lots of love. This is a little special blueberry treat that Grandpop Tony DiMeo would ask Grandmom DiMeo to make for him on Sunday afternoons. A blueberry desert that he greatly enjoyed while watching a baseball or football game during his day of rest on Sunday from the DiMeo family blueberry farms in Hammonton. You can add a handful of healthy organic aronia berries if you want an extra antioxidant boost of energy for this berry smoothie recipe. If you had to pay for a smoothie like this at a smoothie cafe, you would pay up to $8.00 for just one of these yummy drinks. Just think of all the money you will save growing your own organic berries for smoothies like this. Make an investment in your health and grow your own organic blueberries. In a blender, combine DiMeo blue berry farms fresh blueberries, juice, organic yogurt and sugar. Blend until smooth, about 1 minute. Serve the smoothie immediately in pre-chilled tall glass. Garnish with blueberry skewers spiraled with thin strips of orange peel. Yields two (2) blueberry smoothie drinks made with locally grown berries. 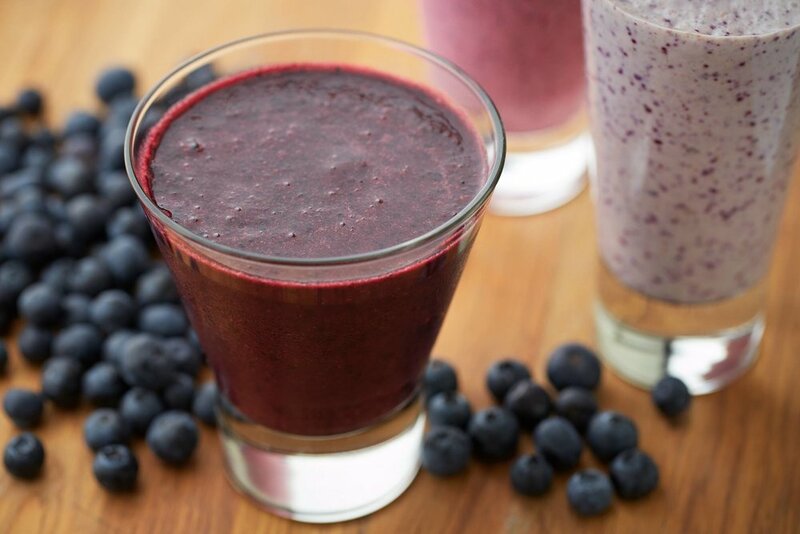 You can also make this healthy blueberry smoothie with fresh aronia berries (a.k.a) aronia black chokeberries with higher antioxidant health benefits of aronia berries (three times more than blueberries) with fresh aronia berries grown in your own backyard. Go to our blueberry plants section of this website to see aronia berry plants for sale by DiMeo Farms & Aronia Plants Nursery. Aronia berries are a very healthy berry that is perfect for juicing berries or baking with organic aronia berries. We have aronia berry plants for sale at our berry farm. Learn how eating healthy aronia berries can change your life. Call us now to learn about planting aronia berry bushes for sale: (609) 561-5905 and take the first step toward better health. 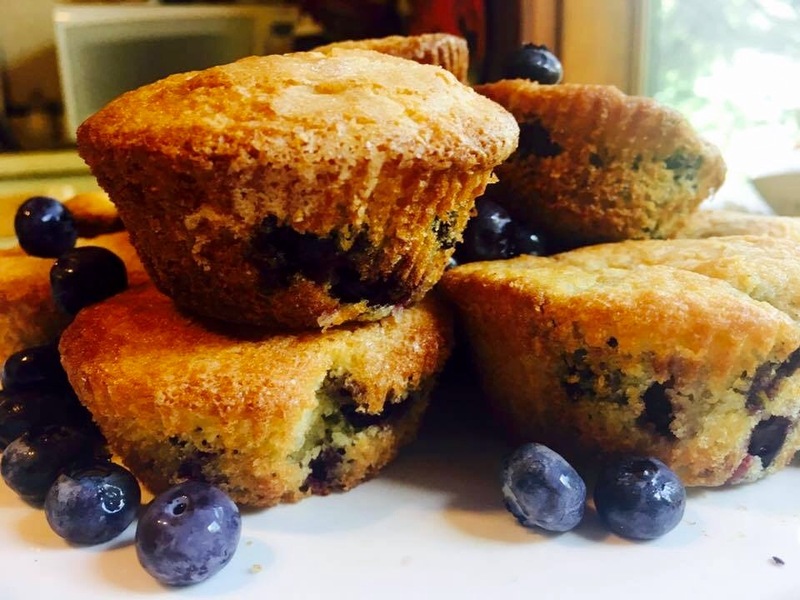 Learn how to make old fashioned homemade blueberry muffins from scratch with our delicious blueberry muffin recipes by grandmom Mildred "Millie" DiMeo of DiMeo Blueberry Farms in New Jersey. This blueberry recipe was featured in Hobby Farm Home Magazine on pg. 66 of July/August edition which features our DiMeo family farms. 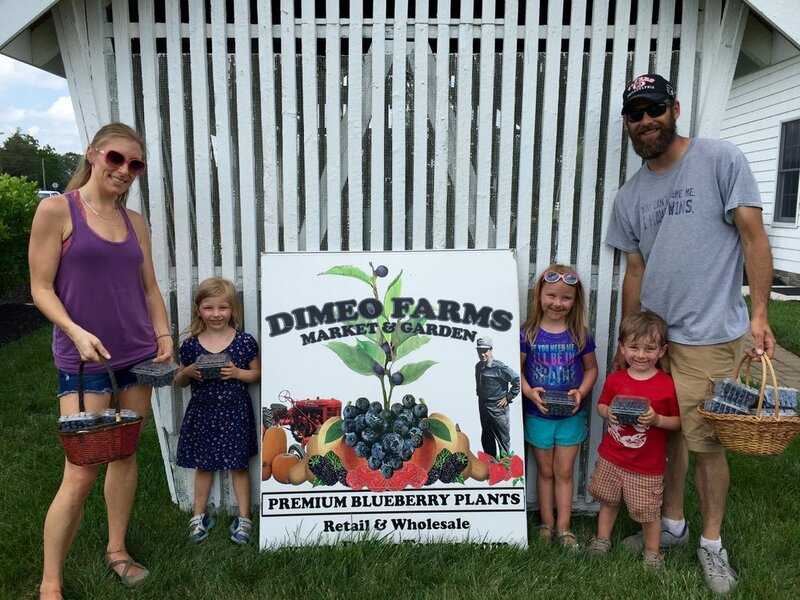 Check out a photo from the gardening magazine on our DiMeo blueberry plants happy customer photo gallery on our DiMeo Farms blog page. Preheat oven to 400 F. Grease twelve 2 1/2-inch blueberry muffin cups. Toss DiMeo Blueberry Farms blueberries with 1 tablespoon of flour. Combine remaining 1-3/4 cup flour, the sugar, baking powder, baking soda, nutmeg and salt; set aside. Beat farm fresh egg, sour cream and organic milk; stir into flour mixture until just combined (batter will be lumpy). Stir in fresh DiMeo blueberry farms blueberries until evenly distributed. Fill blueberry muffin cups 2/3 full with batter. Bake the blueberry pancakes about 20 minutes until golden. Yum. The best blueberry muffin recipes to make incredible old fashioned blueberry muffins for your family and friends who love farm fresh locally grown blueberries. Makes twelve (12) delicious blueberry muffins. Thank you for reading the best blueberry recipes by DiMeo Farms & Blueberry Plants Nursery. We encourage you to grow your own blueberries for great blueberry recipes using pesticide-free and chemical-free blueberries from your own Heirloom blueberry plants or super-hardy large mature blueberry bushes direct from our family blueberry farm in Hammonton, New Jersey. Just a handful of blueberries every morning in your oatmeal can help you live longer and healthier life. This what it's all about eating better and getting kids to make healthier eating choices with blueberries instead of eating all that junk food. We can ship bearing 3 year-old blueberry bushes to your door for less. Only $10 each. Call us now for a quote: (609) 561-5905 or to arrange to pick-up blueberry bushes at our NJ blueberry farm. Experience the DiMeo blueberry difference for yourself just like happy DiMeo blueberry plants customers did or how about this mom (below) and her two little girls that learned how to grow blueberries from starting with these little blueberry bushes till they grow up to a big blueberry bush. It was a pleasure to spend time with them. They love our family farm blueberry recipes as well. We love seeing your kids grow every year and are honored that people drive hours just pick our blueberries and buy blueberry plants from us. Frozen or fresh blueberries on top of blueberry desserts. Mixed into old fashioned blueberry pancakes. Blended into delicious blueberry smoothies. Handful of fresh blueberries in breakfast oatmeal. Healthy blueberry drinks as in a glass of blueberry wine once a day for heart health. Blueberry juice blended. Blueberry liquor after a healthy dinner (best served chilled). Blueberry ice tea or lambic blueberry beers which you can easily make at home, as with making blueberry wines. Blueberry jam on homemade blueberry pancakes, in sandwiches, holiday cookies or blueberry yogurts with aronia berries added for a higher cancer fighting berry. Be sure to grab some blueberry jam when you come to pick blueberries this summer at the farm. It’s really the best! Dried organic blueberries wherever you would typically use raisins, just use blueberries instead. Blueberry muffins homemade. Blueberry granola or even make blueberry trail mix for a quick afternoon snack to hold you over until dinner time. Candied blueberries with blueberries dipped in homemade chocolate or blueberries in chocolate bark, or chocolate blueberry truffles if you are having guests over for after dinner dessert. You can give away your chocolate dipped blueberries for Valentine's Day gift or another original gift idea. Locally grown blueberries are the best picked farm fresh, on top of blueberry yogurt or blueberry ice cream, or add farm fresh berries to your breakfast cereal, on top of blueberry salads, inside blueberry pastries or incorporated into homemade blueberry bread. Below happy DiMeo customers took her adorable son to pick blueberries. Growing Blueberry Trees or Shrubs. Did you know that some people refer to blueberry plants or blueberry bushes as blueberry trees or blueberry shrubs but, actually the correct term is blueberry plant or blueberry bushes and not blueberry tree or blueberry trees cause if that were the case, we would say large blueberry trees for sale by DiMeo Blueberry Trees Nursery. Bring your kids this Summer 2019 between June 1st to August 25th to pick blueberries at our PYO blueberry farms in NJ where they can pick berries for only $1.66 per pint. Couples of all ages really love coming to our PYO blueberry farm. It’s the perfect original date idea.